The world's biggest book sale featuring three million brand-new English and Arabic language books of all genres will be offered at 50 per cent - 80 per cent discount at the first-ever Big Bad Wolf Book Sale Dubai starting October 18. Held in partnership with The Mohammed bin Rashid Al Maktoum Knowledge Foundation (MBRF), the National Media Council (NMC) and Dubai Production City, the sale is open 24 hours a day, non-stop, for 11 consecutive days at Dubai Studio City, Sound Stage Venue. Doors open at 9m on October 18 and will close at 11.59pm on October 28. 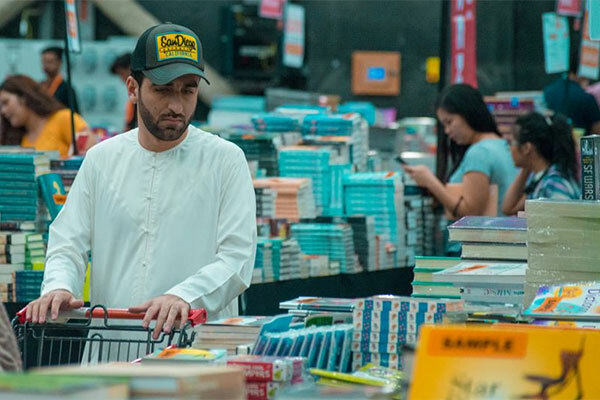 “Our vision of bringing The Big Bad Wolf Book Sale to Dubai is now a reality,” said Mohamed Al Aidaroos, managing partner of Ink Readable Books, the organiser of The Big Bad Wolf Book Sale Dubai. MBRF has contributed a number of Arabic books and publications through its publishing arm, Qindeel Printing, Publishing and Distribution, as part of its commitment to promote the widespread use of the Arabic language. With MBRF’s latest Arab Reading Index revealing that the average Arab citizen reads around 17 books per year, Al Aidaroos said that the event is ready to host hundreds of thousands of English and Arabic bookworms, occasional readers, students, families and avid shoppers over the next week-and-a-half. Thousands of book lovers attended the Big Bad Wolf Book Sale Dubai’s special VIP Day today, with Big Bad Wolf members and competition winners given exclusive pre-sale access. The VIP Day was inaugurated by Jamal bin Huwaireb, CEO of MBRF. “The Big Bad Wolf Book Sale arrives in Dubai with over three million brand new books at amazing discounts. We are delighted to partner The Big Bad Wolf Sale and would like to encourage everyone to visit the sale at Dubai Studio City, Sound Stage Venue,” said Jamal bin Huwaireb. Founded in 2009 in Kuala Lumpur, Malaysia, Big Bad Wolf Books has been to multiple Asian cities in the last decade, including Jakarta, Manila, Cebu, Colombo, Bangkok and Taipei. Dubai’s very own Big Bad Wolf Book Sale will reflect its commitment to ‘Changing the World One Book at a Time’. Readers of all interests, financial status or age groups can expect to find bestsellers, novels, business books, art and design titles, cookbooks and a wide range of children’s books from augmented reality to activity books. “If you take the average thickness of one book and you imagine all the books at Big Bad Wolf Book Sale Dubai piled up into a single stack, it will be a cloud-piercing tower of books that is 48 times taller than the Burj Khalifa. We have a lot of books and we invite everyone to come and experience it,” said Al Aidaroos. Majed Al Suwaidi, managing director of Dubai Production City and Dubai Studio City, said: “As part of our support to the reading initiatives launched by Sheikh Mohammed bin Rashid Al Maktoum, Vice President and Prime Minister of the UAE and Ruler of Dubai, the Big Bad Wolf initiative meets our values of enabling education and sharing knowledge.